End class by indulging in a delicious and impressive vegan three-course meal, prepared by you! Let's be real: If you complied with your daily pad thai cravings and ordered in from the local Thai joint every night, you wouldn't be in the best place, health-wise. But why practice self-restraint when you can get the best of both worlds -- holistic nutrition AND flavorful Thai cuisine? 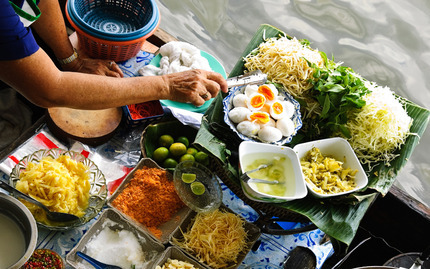 During this hands-on cooking class, you'll learn how to cook authentic and healthy Thai meals, using only organic, non-GMO produce. Plus, you'll also discover how to avoid MSG and gluten completely and use minimal sodium in your cooking. You'll pick up new techniques, knife skills, culinary theories, and recipes as you prepare a delicious three-course meal comprised of pad wun sen, coconut soup mixed mushroom with sprouted soybean tofu, and green curry eggplant served on rice noodle. And yes, you'll get to devour your meal at the end of the class, so it's best to come hungry! A 2 weeks notice is required for cancellation or rescheduling on all classes to get a credit toward another group class within 1 month of cancelled class. No refunds will be given. If within 48 hours of class date you find yourself unable to attend please let us know and you will need to send someone in to cover your spot.